Graduate Faculty Senate (GFS) meets monthly during the academic year. An agenda item during each meeting is dedicated to reviewing and approving new and revised course proposals. No courses will be approved during the months GFS does not meet. Use the button above to access the Curriculum Inventory Management (CIM) system. You will be directed to log in using your MU username and password. If you have questions about the system, contact muregistrarcatalog@missouri.edu. More details are provided on the Registrar’s website. Once in the system, you can propose a new course or edit a course. Course deactivations are managed through the edit a course option. 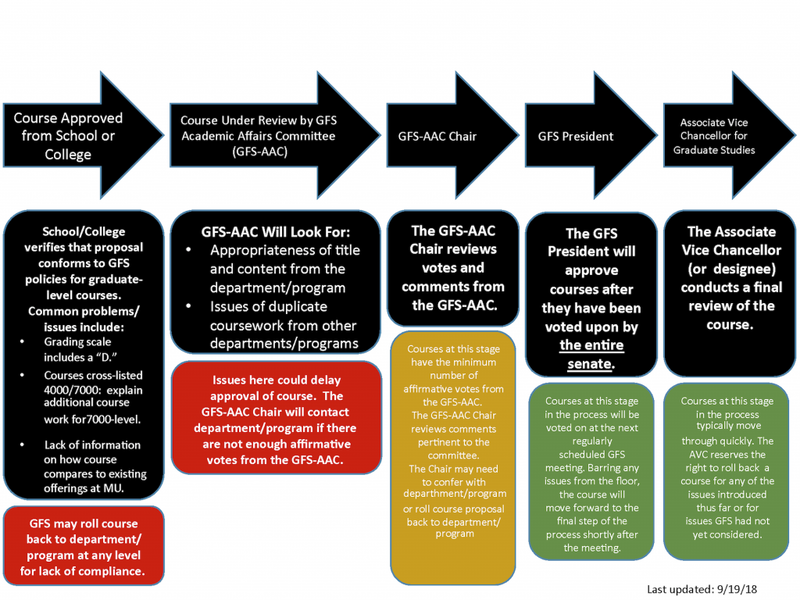 Courses will follow a systematic process of approvals, including approval by the Graduate Faculty Senate and the Associate Vice Chancellor for Graduate School. Only deleted courses do not require approval by the Graduate Faculty Senate. Topics courses may be submitted to the Registrar’s office without prior approval by the Graduate Faculty Senate. The Senate urges that programs and departments teach courses only up to five times prior to seeking permanent course status. The Graduate Faculty Senate does not exercise formal control over the topics courses that graduate programs propose. For topics courses at the graduate level, please email ourschedule@missouri.edu to submit specific topic title. If the course is cross-leveled (4000-level/7000-level), you will still need to complete an Undergraduate Proposed Topics Form for the undergraduate portion.